Age: 17 Height: 185 cm (6'1") Weight: 95 kg (210 lbs) Affiliations: 104th Trainees Squad,Scouting Legion Graduation Rank: 2nd Strong willed, with a solid constitution. Most adept at gaining the trust of his comrades. Ranked no 2 of the trainee class. Helps Eren out during his training days. Later in the story shown to be the armored type Titan. 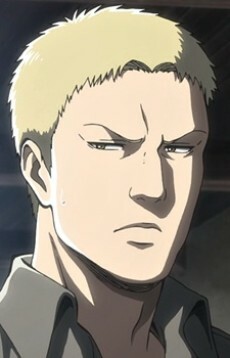 Note: Reiner Braun is the official English translation by Kodansha.